After a trip to Ikea, home of the Swedish Meatball, I left feeling sad that they didn’t have any delicious Keto Swedish Meatballs for me. And for all the fellow keto eaters out there. 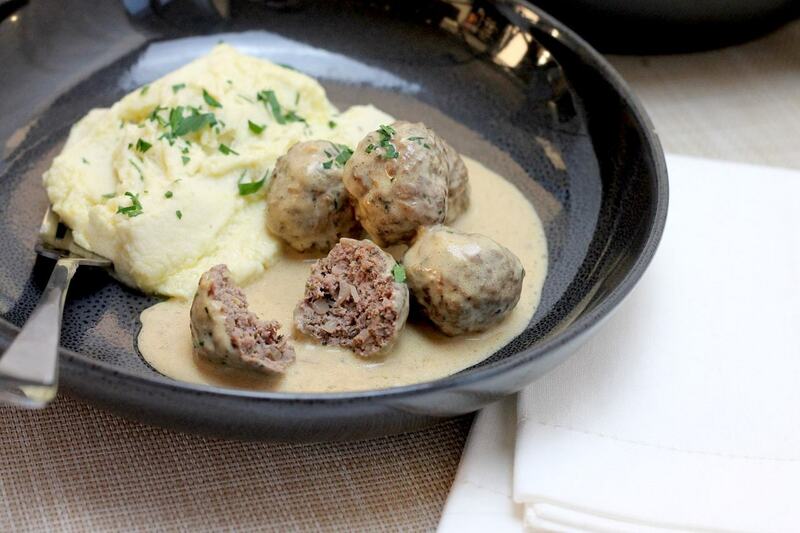 Traditional Swedish Meatballs are delicious, but unfortunately rely on breadcrumbs AND flour for their texture and flavour – hello carbs! 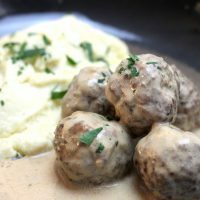 In this Keto Swedish Meatballs recipe, I have made a few substitutions and amped up the flavour a bit, to create some really tasty meatballs and a Keto gravy to go with it. I find the very traditional gravy to be a bit on the bland side. 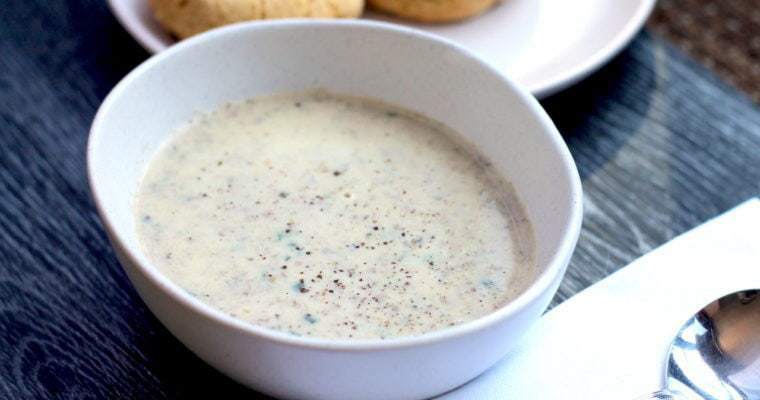 I think American gravy is often quite creamy and light in flavour, whereas I love my Keto gravy to have a more meaty and sweet flavour to it. In my usual style I’ve pumped it up and added some other tricks to get it really flavoursome and delicious to pair beautifully with the savoury Keto Swedish Meatballs. 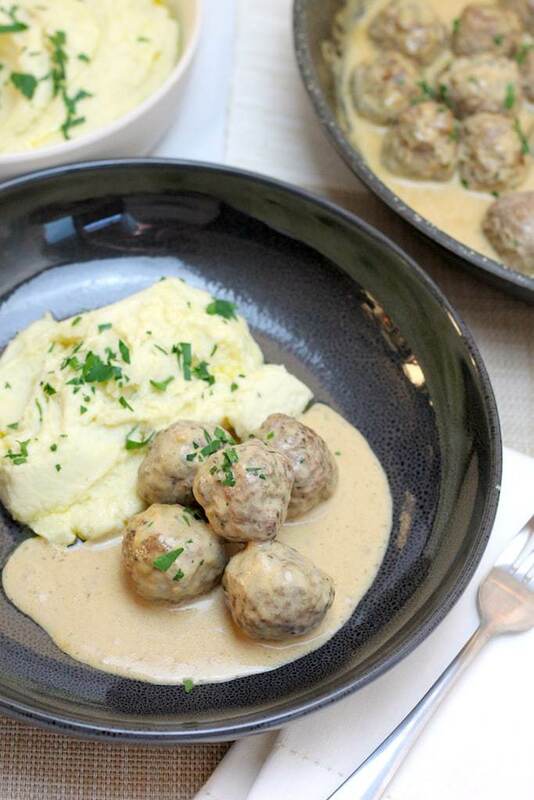 These Keto Swedish Meatballs can also use different meat mince other than beef. Beef can be a little on the dry side, so you could try with pork, chicken or even lamb! I like a mix of pork and beef mince myself, as I find the pork mince gives the meatballs a great texture and the fat helps bind them together. I use the xanthan gum to thicken the sauce up without the need for flour or corn starch. If you aren’t familiar with Xanthan Gum, it’s a vegetable gum that gives things a sort of gooey texture. I bought one bag when I first started keto and am not even a quarter of the way through. If you don’t have xanthan gym or don’t want to buy it, then just leave it out. It just means the Keto Gravy will be a little thinner – no problem if you don’t mind that! This stuff will last you forever because you usually only need a teaspoon at most. I buy this one from Amazon because it’s a small container, but you can also get it from iherb and most health food stores these days. Don’t forget the Keto Cauliflower Mash! These delicious Keto Meatballs are of course not complete unless served with my ultimate creamy Keto Cauliflower Mash. Using a food processor, blend that cauliflower to puree perfection! This recipe also uses beef stock to give the gravy a really rich flavour. In an ideal world, we would all make our own, but if you don’t then use a good quality one and check the ingredients for no hidden nasties – ie. not bullion cubes! 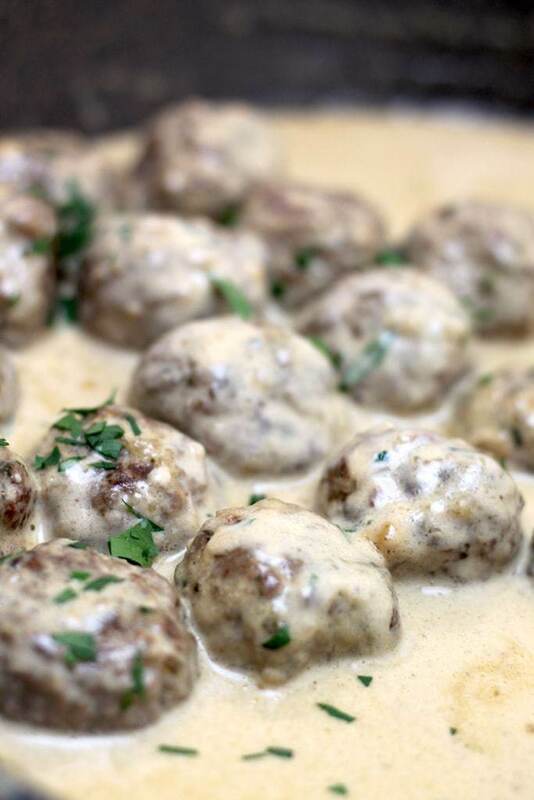 Enjoy these Keto Swedish Meatballs immediately, piping hot or warmed up the next day. If you love meatballs like me, check out these other delicious Keto Meatball recipes – the kids love them! 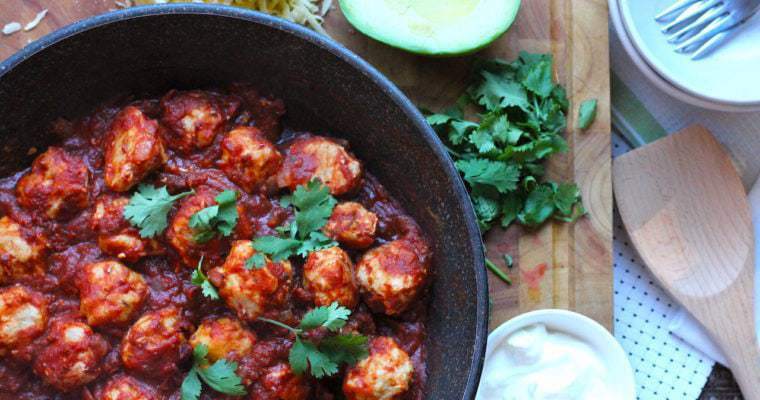 Delicious, succulent spiced meatballs in a creamy and hearty gravy - the perfect winter warmer! 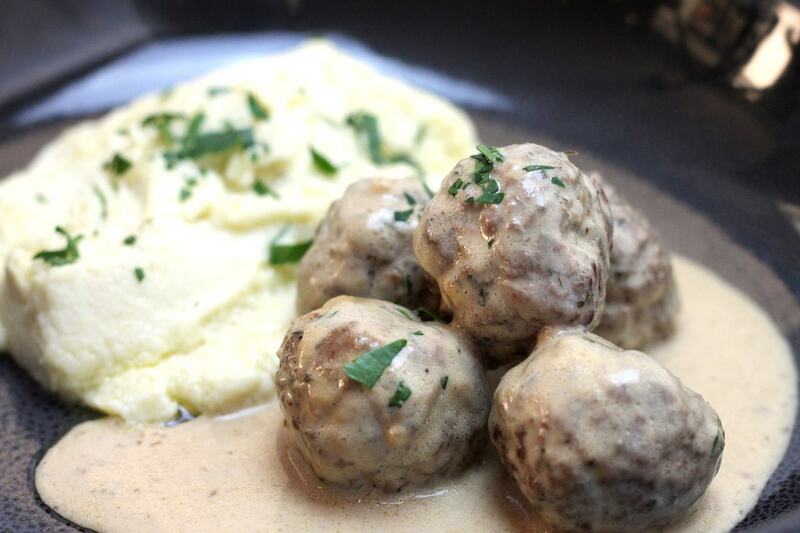 These Keto Swedish meatballs use xanthan gum to make a thick sauce - you can omit but will have a much thinner sauce. In a mixing bowl, combine all meatball ingredients excluding butter. Combine with your hands, working the spices and onion through the meat and massaging it well to help melt the fat through the meat. The more you massage, the better they stay together! Roll the minced beef into meatballs, making around 20 large or 25 smaller balls. In a large frying pan, melt the 25 grams of butter over medium heat until just starting to foam, then add the meatballs. Cook for 5 - 6 minutes, turning gently and basting with the melting butter on all sides. Once browned, set the meatballs aside. Add to the frying pan (without cleaning), the remaining 50 grams of butter and melt down, scraping up any meaty scraps on the bottom of the pan. Add the beef stock, cream, sour cream, worcestshire sauce, dijon mustard and salt and pepper. Stir to combine and taste for additional seasoning. Once it has reached a low simmer, scoop out 3 tablespoons of the gravy into a small bowl and whisk in the xantham gum. Combining with warm and fatty liquids helps it dissolve evenly. Return this xantham gum mixture back to the pan, then add the meatballs back in and baste with the gravy. Let simmer for 10 - 15 minutes until the meatballs are cooked through and sauce thickened to your liking. Serve immediately with cauliflower mash. 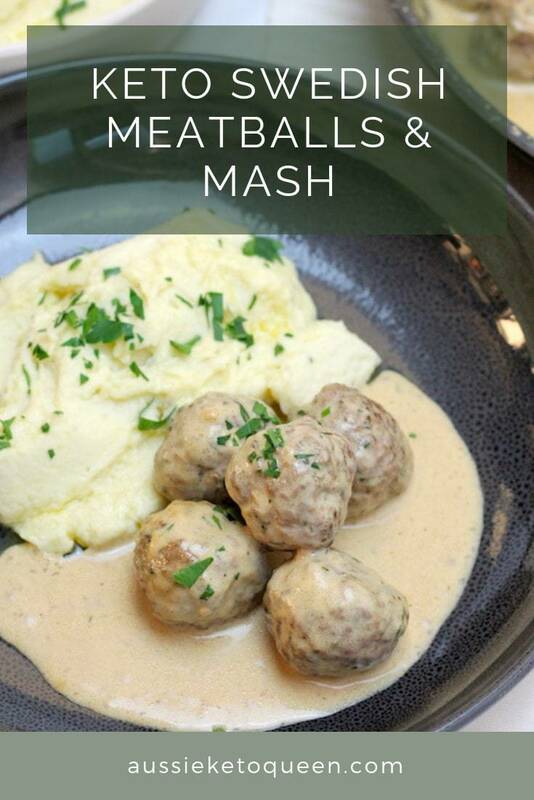 I was just thinking yesterday about adapting m my better than ikea meatball recipe to keto. I think youre on the right track . I also use egg and a table spoon of coconut flour to bind meatballsv i also wonder if cream cheese could be used. I also love adding some mushrooms for added colour and flavour. I get Xanthan Gum from Coles. $5.00 for 100g. I made your Swedish Meatballs and Caulifower Mash for dinner last night and it was supurb. I followed your recipe to a “T” and I won’t change anything the next time I make it. The combination of spices, herbs and other ingredients was just perfect. Thank you; this recipe is a keeper!